“If you build it, they will come….” Thus, a cornfield in Iowa now boasts a baseball field. Similarly, the cornfields 20 miles from the Twin Cities metro were the unlikely choice for the birth of Chanhassen Dinner Theatres. Celebrating its 40th anniversary this fall, the company testifies, too: “If you sing it,” well…attendance has topped eight million guests, and counting. Founders Herb and Carol Bloomberg, whose mutual passion for Broadway musicals launched the unlikely 600-seat dinner theater in this then sleepy farming town of 500, weren’t babes in the boonies, after all. The Chanhassen’s immediate success prompted the addition of three more adjacent stages with complete costume and set shops on the premises. 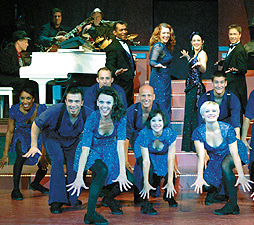 They said it couldn’t be done, but as the years ticked by, proving otherwise, the Chanhassen has emerged as the largest professional dinner theater in the nation—it’s also the largest privately owned restaurant in the state—and the largest employer of professional, Equity card-carrying actors in the Midwest. When it came time to pass the torch in 1989, the Bloombergs entrusted their baby to entertainment entrepreneur Thomas K. Scallen. By this time, the naysayers had learned a new whine: Dinner theaters are dinosaurs, dying faster than you can say Oklahoma!. In other words, the shows must go on. But dinner was another matter. Serving 1,200 guests a night in a 90-minute window presents a mammoth challenge in itself, and we’re talking steaks grilled to order, not Mystery Newburg from a warming pan. Yet Scallen made it his mandate to upgrade the fare. As the younger Scallen explains it, “For many folks attending, this may be the nicest place they’ll ever eat”—so make it as memorable as what’s on the other side of the footlights. Well, by putting yourself on the line, and directing a production-as-audition. Brindisi chose Noel Coward’s witty Private Lives for the intimate Fireside Theatre, which led to a second tryout, a huge mainstage show called Edwin Drood—it flopped at the box office, but the critics loved it—followed by 42nd Street, which, he reports, was “really solid, really well-received.” Given that this past season he directed his third 42nd Street for Chanhassen, it’s clear he passed the test. Darn right. Witness the recent, hot and rockin’ Grease, which broke all box office records. Sure, Brindisi will continue to please them with Fiddler and Oklahoma!, but just as often (nowadays, even oftener), shake up the mix with something like Hairspray or Mamma Mia—being considered for future staging—or The Producers, which opens October 10. Tommy Scallen adds, “Just like Broadway has changed, so has our demographic, and so has the subject matter. You can take more risks.” Rent stated the ball rolling, he believes. Both agree it pays off to foster a core company of local talent, both onstage and behind it. Yet, to inject necessary freshness, Brindisi auditions for new blood, too. For many, it’s home. For others, it’s an ideal chance to show what you can do, and possibly be picked up elsewhere—like Laura Aspness, who rocketed from Chanhassen’s Grease to the Broadway production. Also nurturing that next generation of talent are the summer theater camp for kids, and the performance training classes for teens and adults, instituted by the elder Scallen. Still, the standard joke the younger Scallen tells is: “How do you get young people to a dinner theater?” Answer: Wait till they get old. That’s precisely why others across the country are going dark. In one of its ventures to prove that old saw wrong, Chanhassen actively is seeking out broader, younger patrons. In fact, Chanhassen launches its first GLBT Night on October 23, during the run of The Producers, offering complimentary appetizers, discounted drinks and tickets, and a chance to schmooze. For information and tickets, call (952) 934-1525, or visit www.ChanhassenDT.com.